For almost a year, now, I have partnered with Marv Plementosh of One Million Tracts to publish several gospel tracts. 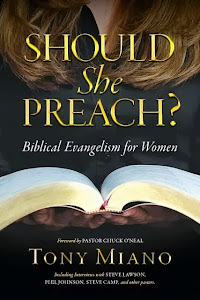 Check this page regularly as my line of gospel tracts grows. “You have the right to remain silent. Anything you say may be used against you in a court of law. You have the right to an attorney. If you cannot afford an attorney, one will be provided for you. Do you understand the rights I have just read to you? This is the Miranda Warning. 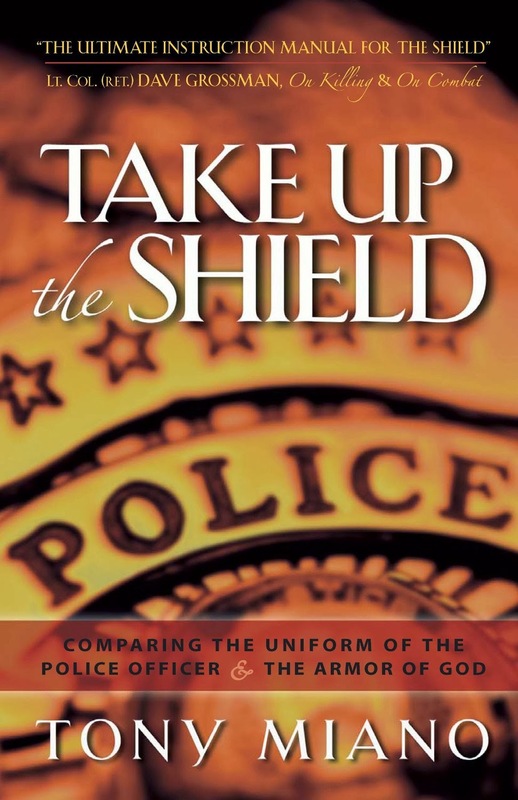 What most people don’t know is an officer is not required to read you “your rights” when they arrest you. Nor are they required to read you “your rights” before talking to you. 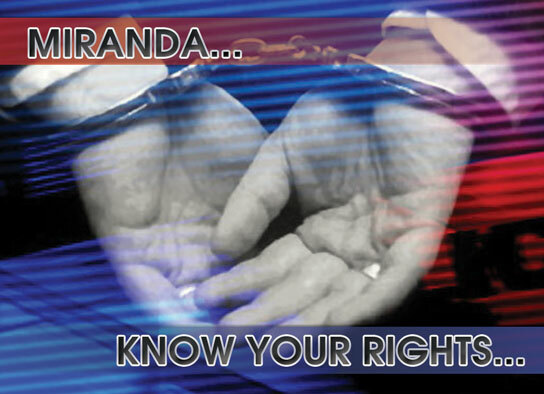 An officer must read the Miranda Warning to you only if you are under arrest and they want to question you. 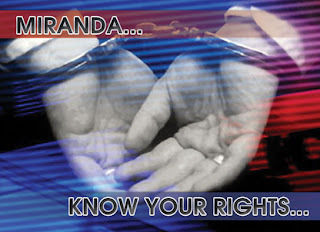 Both elements—custody and interrogation—must be present for a Miranda Warning to be required. Many people misunderstand their “right” to remain silent. Even more people wrongly believe they will have a “right” to speak to God on the Day of Judgment. 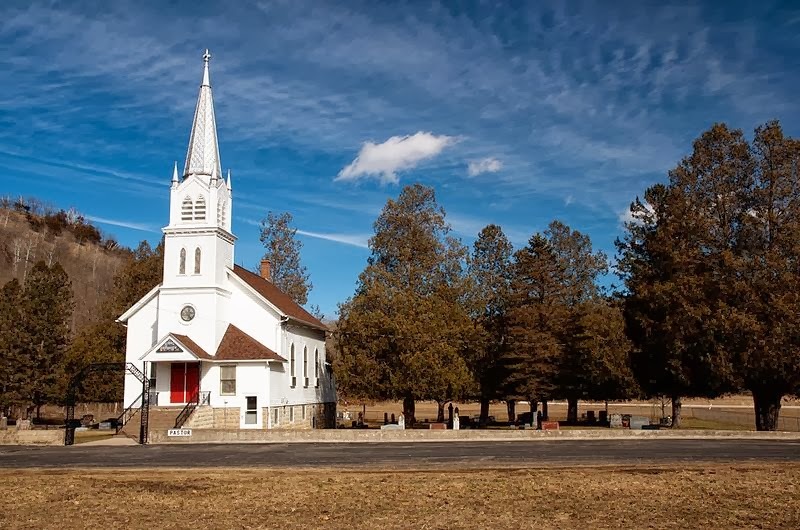 Most people think on that day they will argue their case before God and present evidence or eyewitness testimony of their goodness and their worthiness of heaven. But the Day of Judgment is not a court trial. It is a day of sentencing. The Bible makes it clear. Because you have broken God’s Law (lying, stealing, hate, lust, selfishness, bitterness, coveting, blasphemy, etc.) you have been judged already (John 3:18-20) and the wrath of God abides on you (John 3:36). Your only hope is to turn away from your sins, turn toward God, and by faith alone receive Jesus Christ as your Lord and Savior. Jesus Christ—fully God and fully man, yet without sin, born of a virgin, voluntarily shed his innocent blood and died on the cross, taking upon Himself the punishment you rightly deserve for your sins against God. Three days later, He forever defeated sin and death when He rose from the grave. Receive forgiveness. Repent and believe the gospel, today. 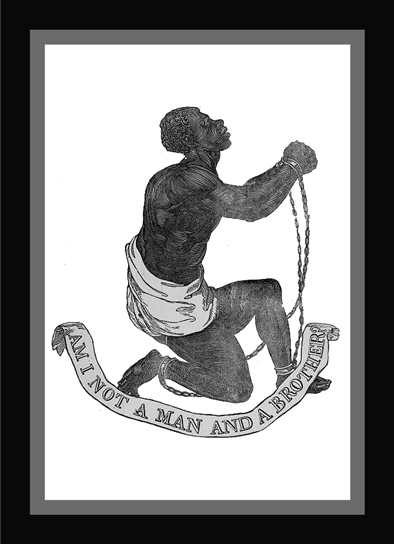 Abolitionists like Granville Sharp, Thomas Clarkson, and Josiah Wedgewood used this haunting image and the motto “Am I not a man and a brother” to show their opposition to slavery in England. The British slave trade was outlawed in 1807 and slavery was later abolished outright in Great Britain, in 1833. The movement to abolish slavery in the United States began in the 1850’s. Leaders like William Lloyd Garrison, Harriet Beecher Stowe, and Frederick Douglass also used the image and motto. They fought for black Americans to be seen as fellow human beings and brothers, not pieces of property. With the ratification of the 13th Amendment, slavery was abolished in the United States. While slavery is gone in the United States, there are still people in this country who are treated as less than human. More than 50 million of them have been murdered since 1973. They are aborted children. Murder is a sin (Ex. 20:13) and God hates those who shed innocent blood (Prov. 6:16-19). Do you support the murder of unborn children by your words and actions or with your silence? Then God sees you as one who is swift to shed innocent blood and guilty before Him (Rev. 21:8). Because God is holy, righteous, and just He will punish your sin by sentencing you to hell for all eternity. Your only hope is to turn from your sin and turn toward God (repent) and by faith alone receive Jesus Christ as your Lord and Savior. Jesus Christ, who is fully God and fully Man, born of a virgin, and knew no sin shed His innocent blood on the cross and rose from the grave so that those who repent and believe the gospel can be saved. Only Jesus can forgive your sins (hatred, murder, lying, stealing, blasphemy) against Him and give you the gift of eternal life. Repent and believe, today. The Hubble Telescope captured this image. 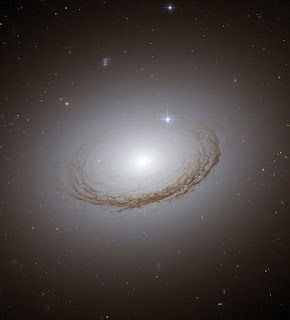 NGC 7049, the official designation for this galaxy, is 150 thousand light-years wide and 100 million light-years from Earth. NGC 7049’s uniquely shaped dust ring formation against its bright interior has led some to nickname the galaxy “The Crown of Thorns,” after the crown of thorns placed on Jesus’s head before he was crucified on the cross. “And they stripped him and put a scarlet robe on him, and twisting together a crown of thorns, they put it on his head and put a reed in his right hand. And kneeling before him, they mocked him, saying, ‘Hail, King of the Jews!’ And they spit on him and took the reed and struck him on the head” (Matthew 27:28-30). Jesus Christ, the King of kings and Lord of lords, fully God and fully man, God in the flesh, born of a virgin, yet without sin, would soon after receiving the crown of thorns, be nailed to a Roman cross. There He would die a sacrificial death though He never sinned in thought, word, or deed. Three days later, Jesus would forever defeat sin and death when He rose from the grave. This Jesus, the One who created you and NGC 7049, is the one before whom you will one-day stand to give an account for your life. If you have ever lied, stolen, taken his name in vain, or harbored jealousy, selfishness, or hatred in your heart He will punish your sin by sentencing you to hell for all eternity. Your only hope is to turn from your sin and turn toward God (repent) and, by faith alone, receive Jesus Christ as your Lord and Savior. Only Jesus can forgive your sins against Him and give you the gift of eternal life. Repent and believe, today. Contradict: “to imply the opposite or a denial of.” This card depicts symbols for ten of the world’s best-known religions. Nine imply the opposite or denial of…the truth. Nine contradict what is true. Only one symbol represents the truth—the cross. Most people in the world are walking contradictions. They assert they are good, when in their heart and mind they know they are not (Romans 2:15-16). See for yourself. Have you ever lied, stolen, taken God’s name in vain, harbored hatred or lust in your heart, or committed idolatry by practicing one of the many false religions of the world? Then God does not see you as good. God will see you as one who has broken His Law and sinned against Him. God’s punishment for sin is eternity in Hell. God has provided only one way for you to receive forgiveness of your sins and the joy of eternal life in Heaven. God sent His Son to earth in the person of Jesus Christ—fully God and fully Man, who knew no sin. He voluntarily went to the cross where He shed His innocent blood and died, taking upon Him the punishment you deserve. Three days later, He defeated sin and death when He rose from the grave. What God commands you to do is repent (turn from your sin and turn to God) and, by faith alone, receive Jesus Christ as your Lord and Savior. Repent, believe the gospel, and stop living a life of contradiction. “Jesus said to him, ‘I am the way, and the truth, and the life. No one comes to the Father except through me’ (John 14:6). Turn to Christ and live. Before becoming the United States’ most beloved president, Abraham Lincoln was a lawyer. He was known for his great pearls of wisdom, like the one on the front of this card. “He who represents himself has a fool for a client.” The same is true for anyone who thinks they will stand before God, serve as their own attorney, and argue their innocence and goodness. They will have a fool for a client. “For all have sinned and fall short of the glory of God” (Romans 3:23). Consider the evidence against you. If you have ever lied, stolen, taken God’s name in vain, harbored hatred or lust in your heart; God sees you as one who has broken His Law and sinned against Him. Finding you guilty, He will do what any good judge would do. In your case, the punishment will be eternity in Hell. “Therefore do not be foolish, but understand what the will of the Lord is” (Ephesians 5:17). God has provided only one way for you to receive a pardon from the Judge and the gift of eternal life in Heaven, with Him. God sent His Son to earth in the person of Jesus Christ—fully God and fully Man, who knew no sin. He voluntarily went to the cross where He shed His innocent blood and died, taking upon Himself the punishment you deserve for your crimes against God. Three days later, He defeated sin and death when He rose from the grave. What God commands you to do is repent (turn from your sin and turn to God) and, by faith alone, receive Jesus Christ as your Lord and Savior. Don’t be a foolish client. “Judge not that you be not judged” (Matthew 7:1). Second only to John 3:16, Matthew 7:1 is probably the most often quoted verse in the Bible. But what does the verse really mean? It means that one should not judge another person in a condemning, hypocritical, or self-righteous manner. But you make judgments all the time—judgments about right and wrong (murder, stealing, lying, etc.). That’s okay. God does the same thing. The Bible makes it clear there is only one Judge, and that is God. “There is only one lawgiver and judge, he who is able to save and to destroy. But who are you to judge your neighbor” (James 4:12)? When you die and stand before God, you will give an account for your life. “And just as it is appointed for man to die once, and after that comes judgment” (Hebrews 9:27). If you’ve ever lied, stolen, taken God’s name in vain, harbored hatred or lust in your heart, or sinned against God in any way, He will judge you as one who has broken His law. God’s punishment for sin is eternity in Hell. God has provided only one way for you to receive forgiveness of your sins and the joy of eternal life in Heaven. God the Father sent His Son to earth in the person of Jesus Christ—fully God and fully Man, who knew no sin. He voluntarily went to the cross where He shed His innocent blood and died, taking upon Himself the punishment you deserve. God the Son subjected Himself to the wrath of God the Father in order to pay the ransom (the sin debt) for many. Three days later, He defeated sin and death when He rose from the grave. What God commands you to do is repent (turn from your sin and turn to God) and, by faith alone, receive Jesus Christ as your Lord and Savior. Archaeoraptor, Piltdown Man, Nebraska Man, Cro-Magnon, Neanderthal, Swanscombe, Australiopithecus, Lucy, and Ida. They all have something in common. Each has been hailed by the scientific community as the Missing Link—“a hypothetical form of animal assumed to have constituted a connecting link between the anthropoid apes and humans.” They also have something else in common. Over time, they all have been proven to be embarrassing scientific blunders or outright frauds. That’s right. The "Missing Link" that scientists want so desperately to find has never been found. However, there most certainly is a Link. But you’ll never find this Link buried in the ground, for He has risen! When you die and stand before God, you will give an account for your life. If you’ve ever lied, stolen, taken God’s name in vain, or harbored hatred or lust in your heart, God will see you as a lawbreaker who has sinned against Him. God’s punishment for sin is eternity in Hell. God has provided only one way for you to receive forgiveness of your sins and the joy of eternal life in Heaven. God sent His Son to earth in the person of Jesus Christ—fully God and fully Man, who knew no sin. He was and is the only Link between God and man. He went to the cross where He shed His innocent blood and died, taking upon Himself the punishment you deserve. Three days later, He defeated sin and death when He rose from the grave. What God commands you to do is turn from your sin and turn to God; and, by faith alone, receive Jesus Christ as your Lord and Savior. Repent and believe and see the salvation of the Lord. Were you able to find the mistake on the board? The word “mistake” is misspelled. We often fail to see what is right in front of us. The Bible tells us as much. “For what can be known about God is plain to them, because God has shown it to them. For his invisible attributes, namely, his eternal power and divine nature, have been clearly perceived, ever since the creation of the world, in the things that have been made. So they are without excuse (Romans 1:19-20). When you die and stand before God, you will give an account for your life. If you’ve ever lied, stolen, taken God’s name in vain, or harbored hatred or lust in your heart, God will see you as one who has broken His Law and sinned against Him. You will be without excuse. God’s punishment for sin is eternity in Hell. God has provided only one way for you to receive forgiveness of your sins and the joy of eternal life in Heaven, where you will see Him face to face. God sent His Son to earth in the person of Jesus Christ—fully God and fully Man, who knew no sin. He voluntarily went to the cross where He shed His innocent blood and died, taking upon Himself the punishment you deserve. Three days later, He defeated sin and death when He rose from the grave. What God commands you to do is repent (turn from your sin and turn to God) and, by faith alone, receive Jesus Christ as your Lord and Savior. See God for who He is. See your sin for what it is. Repent and believe and see the salvation of the Lord.